MORE MAC OS X APPS! 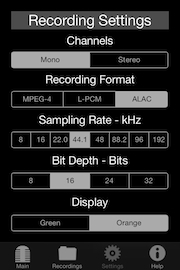 Innovative Handheld Portable Recording App! Turn your iPhone, iPad, or iPod into a $300 handheld portable digital recording device that allows you to capture high quality pristine audio anywhere you go! 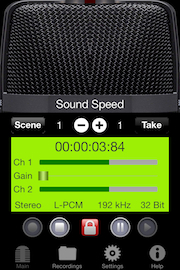 For film, video, and broadcast, to journalism, podcasting, musical performance, songwriting and rehearsal, Sound Speed provides amazing recording quality everywhere all the time with real-time line in metering and audio input gain control. 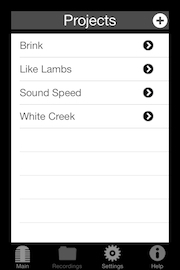 Sound Speed is the most innovative iPhone and iPod audio recorder available! 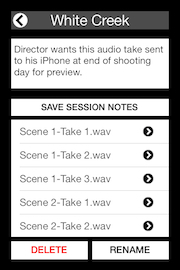 Quickly set scene and take numbers for film and video shoots. Share your files easily with email and iTunes File Sharing. 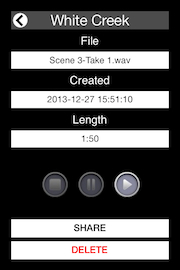 Includes screen lock to protect your recording session against accidental stopping or pausing. Records great mono or stereo audio in these popular formats, MPEG-4 (AAC) as m4a files, Apple Lossless Audio Codec (ALAC) as caf files, and Linear PCM as wav (WAVE) files. All industry standards and readily editable with your favorite software. Multiple recording formats • Selectable sample rate and bit depth • iTunes and email file sharing • Real-time line in level meters • Professional high quality audio recordings • Automatically saves previous settings • Green and orange display backgrounds • Scene and take numbers • Project notes • Gain control • Session notes • Built in user guide • Plus more! Copyright © 2005-2018 Procypher Corporation. iPhone, iPad, and Mac Apps. All Rights Reserved.